Many options do exist for those wanting to cruise as vegans. There is not just one annual hippy, lentil-laden Goa-bound sailing on a rickety 40-year-old ex-Love Boat cruise ship. Ok, I am playing to the stereotype there but I am all about busting cruise stereotypes. Whether they’re held by omnis or vegans. Just like there are cruises for Walking Dead fans (with show stars onboard for events) there are cruises for naturists, metalheads, American Football Fans (Gronk cruise on NCL, anyone?) fans of boybands with said boybands…and cruises for vegans. This September this year there will be a world’s first 100% vegan (according to the agent) seven-nighter ocean cruise from Tilbury/London to Norwegian fjords. 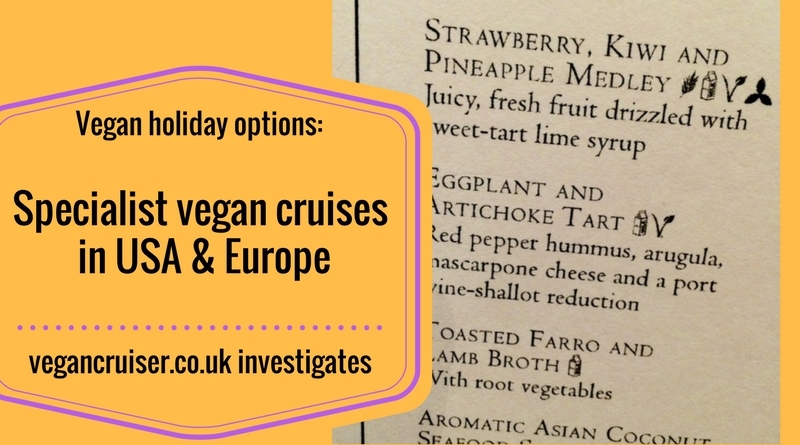 This cruise is sold by a German vegan cruise & tour company Vegan Travel, who have chartered a whole cruise ship from a small UK-based cruiseline CMV. Everything onboard will be vegan, from your cabin toiletries to all food & drink served on the ship. Fully vegan sailing and for the first time on an ocean cruise ship, as all of the previous cruises were all river kind. These sailings treat you to things you won’t find on ‘regular’ cruises. There even were chicken-less nuggets for midnight boozy snacks on the NYE river cruise sailing. You would expect same detail on this first ocean sailing. UK newspaper Metro even had a fab review of the 2016/2017 NYE vegan river cruise – see here. A selection of vegan cheeses and sandwich slices were served at breakfast time. Meanwhile, on most regular cruise lines you may struggle to find a vegan-friendly spread. This company normally does fully vegan river cruises and there are several during the year, but these are on ships they charter from standard river cruise lines for the purpose. Popular vegan blogger Sean aka FatGayVegan was converted to cruising on one of these river cruises and has blogged plenty about this company’s river sailings. He’s also featuring their NYE 2017/2018 sailing on his blog. For those wanting ultimate luxury cruising, there are two Raw Vegan cruise itineraries on the beautiful Adriatic. These on a luxury yacht in July and August this year, where all produce is not just vegan, but raw and organic too. And you will be sailing in the most gorgeous waters of the world – in my opinion. I have called at Split and Dubrovnik on my cruises and loved both cities. I would love to cruise in Croatia more – just look at the testimonial video from 2016 on the Raw Vegan Cruise website. How gorgeous are those views!? Maybe you don’t fancy a Norway sailing in September or raw vegan cruise in Croatia. Perhaps you want to experience Caribbean beaches. Indeed you can. Holistic Holidays at Sea (HH@S) has an annual vegan cruise and next year’s February 2018 sailing to Eastern Caribbean is their 15th-anniversary sailing already. This isn’t an exclusive vegan sailing though, the MSC ship does have non-vegan passengers, food and drink about. Vegan catering is overseen by a team of vegan chefs brought onboard by HH@Sea so vegan options on this sailing are better and more innovative than on a regular MSC cruises. The vegan menu was served in the main dining room during early dining for those booked on the HH@S package. The buffet onboard was open to all at all times but had a limited number of stations that were marked vegan*. Plus obviously, there were separate HH@S events for those booking the vegan experience onboard this MSC mega ship. There’s diet, nutrition, yoga seminars etc. Another US based operation is Vegan Cruiseplanners, a cruise travel agent who arrange vegan group sailings. If you see their website, they have a Canada & New England sailing for this summer and a Mexican Riviera one for the autumn. Both cruises are with Holland America cruiseline (HAL). Again, these aren’t fully vegan sailings, just featuring groups of vegan cruises with extra events. In similar fashion, in March this year, the first ever Esther the Wonder Pig cruise took place. This was a charity fundraiser on a Carnival ship from Miami, for the Happily Ever Esther sanctuary. 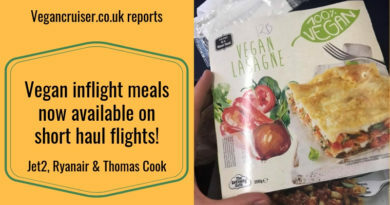 Food onboard for those booking the fundraiser was advertised as ‘Esther approved’ ..aka vegan. This sailing must have been a success as there is another one for February 2018! 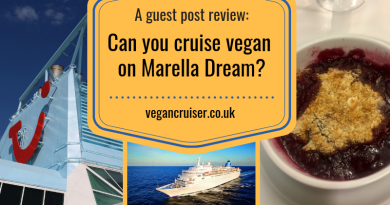 Just a day after MrVegancruiser’s birthday – how amazing would it be to get onboard for this? Even if no Esther onboard. Hopefully a cardboard cut-out at least for photo-op. I’d like that, very much. Esther who, you say? If you don’t know already, read this Guardian article. 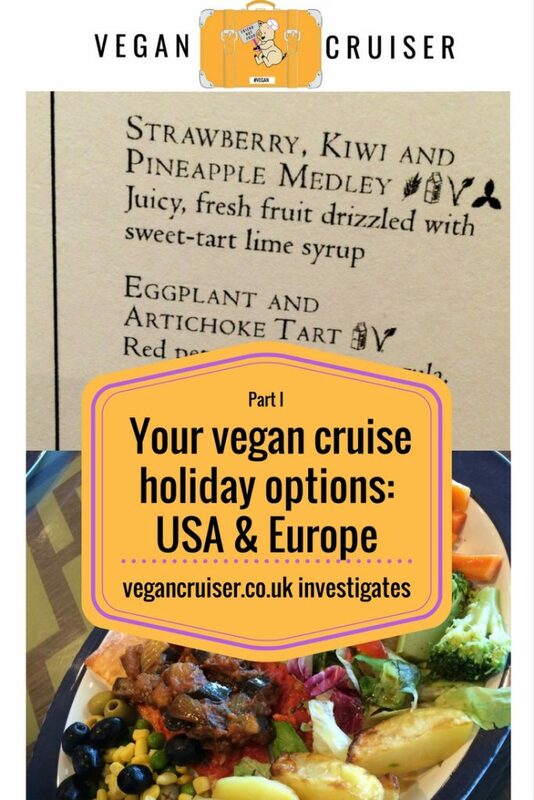 And yes, like the HH@S (MSC) and Vegan Cruiseplanners (HAL) sailings above, The Esther cruise (Carnival) isn’t an exclusively vegan cruise – but with guaranteed vegan dining options for those attending the vegan cruise. So a vegan cruise may be 100% vegan…it could be a cruise that has a large group vegans onboard. Or it might just be a ‘regular’ cruise where you find you’re one of a handful independent vegan travellers onboard. Cruisers like me and Mr Vegancruiser. But THAT is going to be another post. Meanwhile, did you see my ‘10 reasons to cruise‘ post? Any comments or questions about vegan cruise holidays or particular ships these are on, get in touch and I’ll do my best to help! Which one of the above would you prefer the most? I love Croatia but I do love Esther too! ← Top female cruise bloggers to check out! I just love how you are opening up this new world for us. 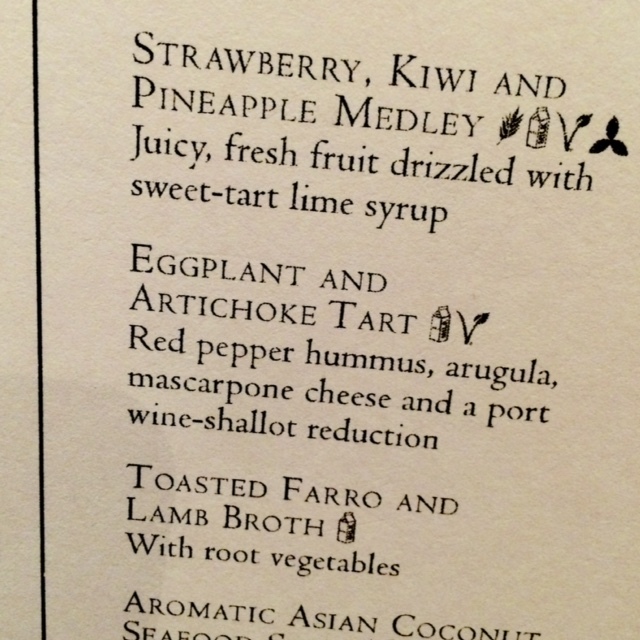 I truly wish all restaurants had such clear allergy/dietary advice, and I too am curious what that last symbol is. And last but not least I LOVE Esther haha.